Written by leading scientists in the field and intended for a broader readership, this is an ideal starting point for an overview of current research and developments. 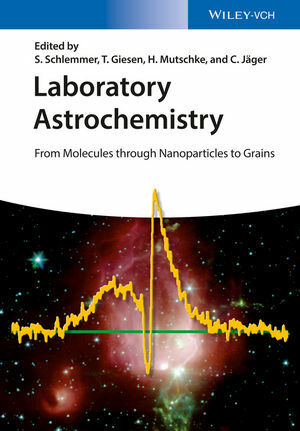 As such, the book covers a broad spectrum of laboratory astrophysics and chemistry, describing recent advances in experiments, as well as theoretical work, including fundamental physics and modeling chemical networks. For researchers as well as students and newcomers to the field. Stephan Schlemmer is the head of the laboratory astrophysics group at the University of Cologne. He received his PhD from Georg August University, Göttingen and was awarded the Otto-Hahn medal of the Max-Planck Society. He spent two years as postdoc at UC Berkeley. At Chemnitz University of Technology he worked as an assistant professor. He was appointed at the Leiden observatory as an associate professor before moving to Cologne. He has authored more than 50 scientific publications specializing in spectroscopy and dynamics of molecular physics. Harald Mutschke is the head of the laboratory astrophysics group at the Friedrich-Schiller-University Jena where he obtained his PhD in solid state physics. He has authored more than 90 scientific publications on spectroscopy of small solid particles with relevance for cosmic dust. Thomas Giesen is a research assistant at the university of Cologne. He received his PhD in physics at the University of Cologne and spent 18 months as a postdoctoral research fellow of the Max Kade foundation at the University of Berkeley. His main research activities comprise reactive carbon containing molecules and radicals, produced in laser ablation and electrical discharge sources. T. Giesen is author and co-author of more than 40 publications in refereed journals. His publication on carbon chain molecules has been awarded the Sir Harold Thomson Memorial award 2003.